It’s time for another cookie recipe. In keeping with the apple theme (don’t you just love fall?! 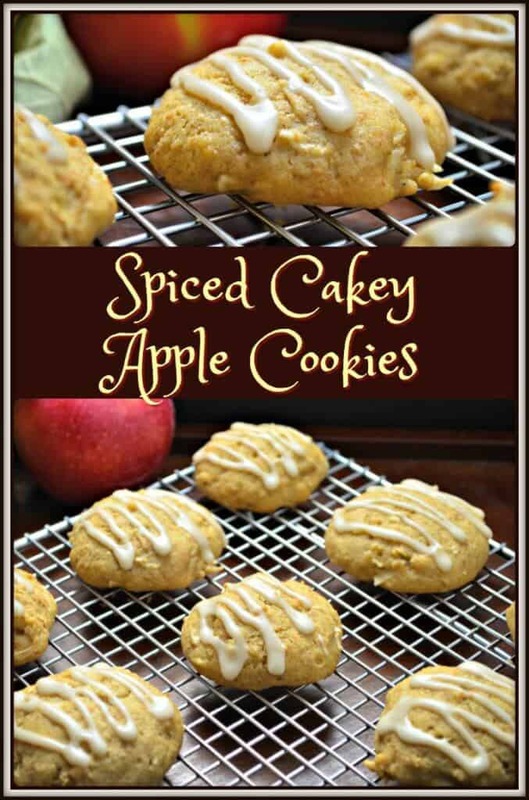 ), I’d like to share one of my favorite recipes, Spiced Cakey Apple Cookies. Autumn is truly my favorite season. The cooler, brisk air is great for taking long walks in the woods. The leaves changing colors and falling; the sounds of the geese flying south in search of warmer weather; the squirrels scurrying around, hiding their treasures as winter approaches… The pace is quick as everyone gets ready for the long winter ahead… trees, animals, and humans! Does everyone have their winter coat ready? I still have four two and a half bags worth of apples from last week-ends’ apple picking outing (They’re running out fast 🙁 ). 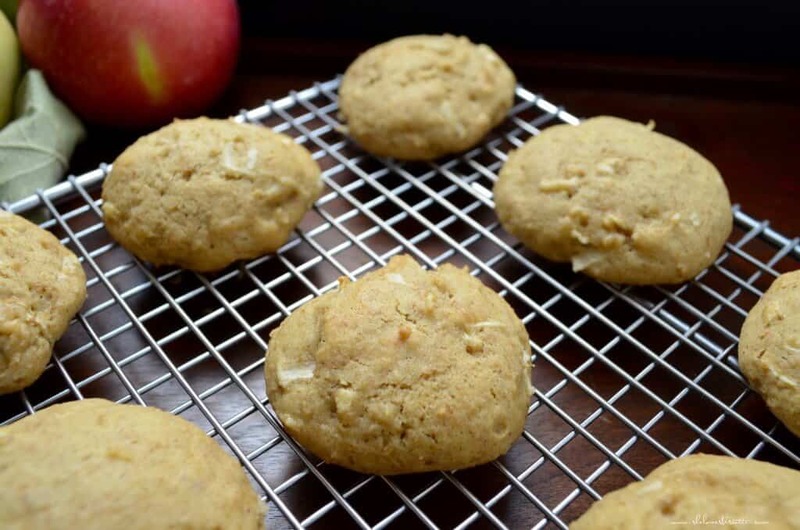 When I woke up this morning, I thought cookies would be grand… and so I cut into my apple rations to make these awesome Spiced Cakey Apple Cookies. 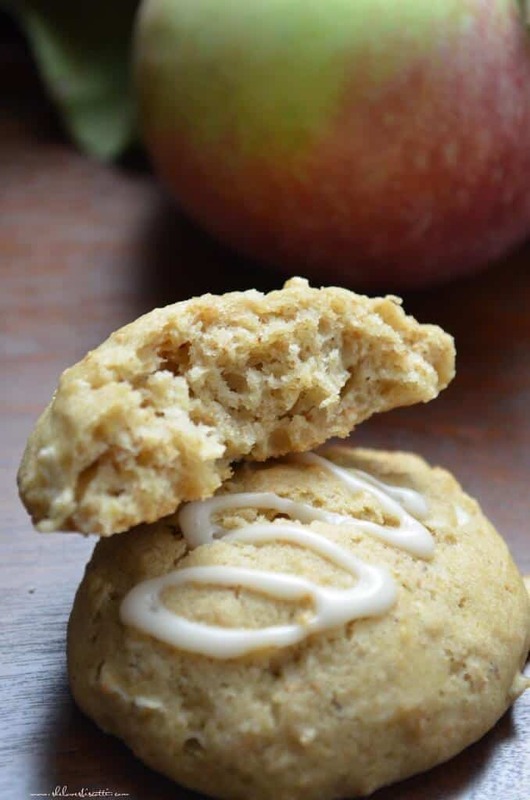 They’ve got just the right amount of apple sweetness, and are lightly spiced with cinnamon, nutmeg and cloves. Although the original recipe includes a glaze, they are equally delicious without it. Over the last couple of decades, I have had many subscriptions to different food magazines. Googling recipes is really convenient, but I love the feel of magazines…pictures of food that I didn’t even realize I had to make! 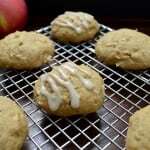 In the October 2010 issue of Everyday Food, by Martha Stewart, one such recipe caught my eye, and I’ve been making Spiced Cakey Apple Cookies ever since! I’ve made a couple of changes to Martha’s recipe: I decreased the amount of sugar and salt; added cinnamon; grated instead of chopped my large Cortland apple ; and will usually add a little something special depending on what I have in my pantry (a handful of nuts, raisins, dried cranberries, chopped dates or chocolate chips, if I’m feeling decadent). The original recipe calls for raisins, by the way. If you are interested, you can follow this link for the Martha’s original recipe. 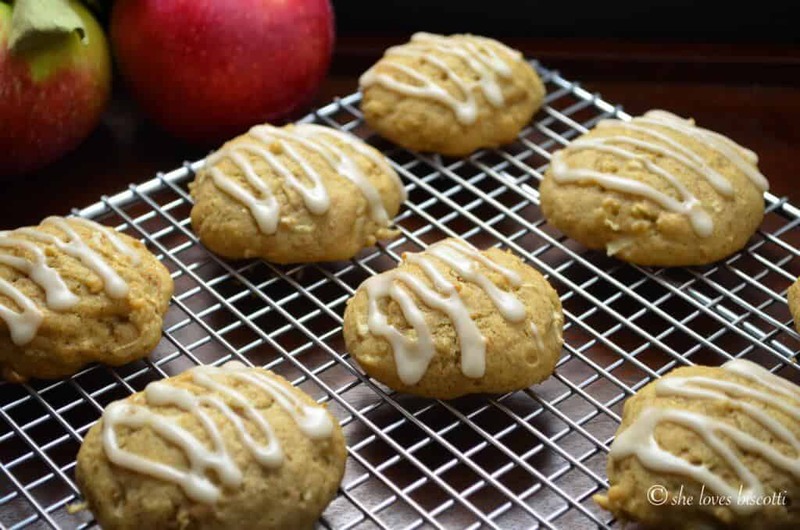 These Spiced Cakey Apple Cookies come together in no time at all – all the more chance for you to enjoy the beautiful fall weather. Hope everyone had a wonderful day! Another cookie recipe!!! 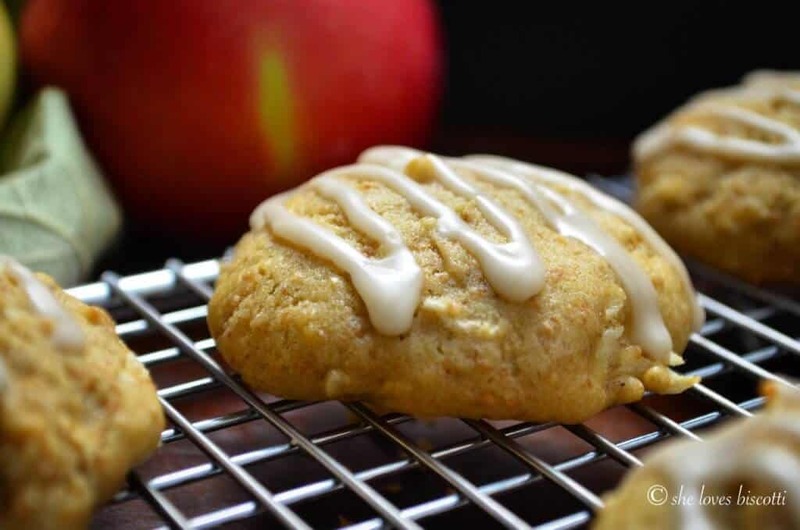 These Spiced Cakey Apple Cookies come together in no time at all - all the more chance for you to enjoy the beautiful fall weather. Preheat oven to 350℉/175℃. Set rack in the center of the oven. Whisk together both flours, baking soda, spices and salt in a medium bowl. Set aside. Add eggs, one at a time and mix well. Make sure to scrape down the bowl after each addition. With mixer on low speed, add half the flour mixture, followed by all the milk, followed by the other half of flour mixture. Mix until just combined. Gently combine grated apple and add-in(if using). With a medium sized scooper, place dough on baking sheet. If desired cookies can be glazed just before serving. Whisk together 1/3 cup icing sugar with 1 1/2 teaspoon of maple syrup and 1-11/2 teaspoon of water. Glaze will be runny. Can be adjusted to your own preference. 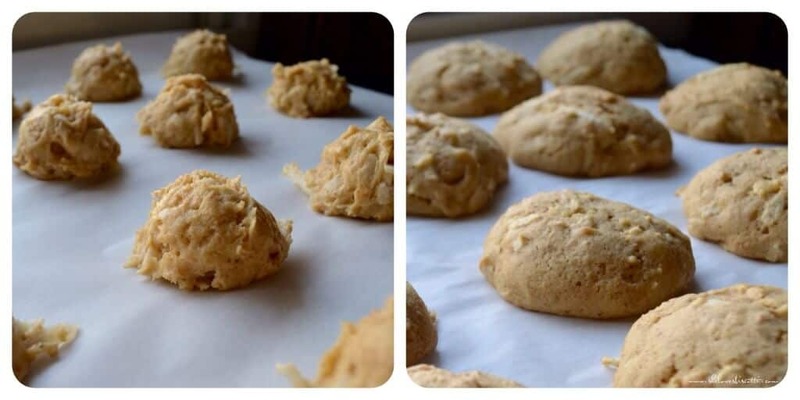 Cookies can be stored at room temperature in an airtight container for up to 5 days.